Ascending Butterfly: Weekly Moment of Gratitude! My #Electronics Got Pimped Edition! Weekly Moment of Gratitude! My #Electronics Got Pimped Edition! Ƹ̵̡Ӝ̵̨̄Ʒ My Love of Twitter Parties - Before I started hosting them, I was attending them. Lot's of them. I became known as the official Twitter Party DJ because I would be the one to make fun song suggestions based on the theme of the party I was attending. Some might even call me the life of the twitter party! (Well OK, bragging just a bit!). But when I'm not hosting I still love attending them, I love the fast pace, catching up with my online friends and being introduced to brands in a fun and interactive way. I recently attended one and it paid off big time! My Television just got pimped thanks to Verizon's Somos Fios! 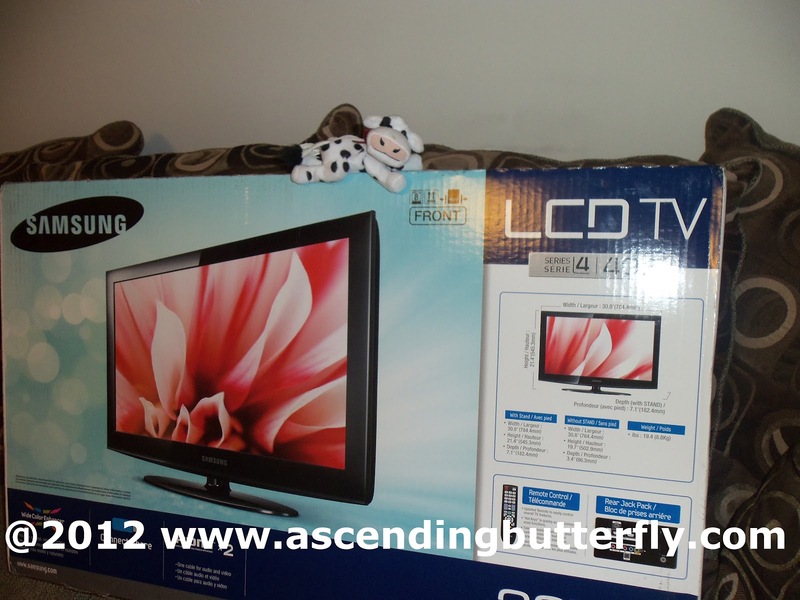 I won the Grand Prize in their recent twitter party, a 32 inch Samsung HDTV Television! Check it out below! Don't you just love my super cute Turkey Hill Cow sitting happily on top of the box? You can get social with them to on Twitter and Facebook and via twitter use the hashtag #SomosFios, and hint hint, feel free to tell them on twitter and facebook that you would like them to host a twitter party with Ascending Butterfly, aka @Ascending1 as the host! Ƹ̵̡Ӝ̵̨̄Ʒ - Out and About - I have had the opportunity to attend some fun events about town (the benefits of living in New York City is that there is something going on pretty much at all times) and I'll keep posting more recaps as often as possible! Thanks so much for linking up. Congratulations on winning such a fantastic prize. I must join your tweetup parties. Sounds like fun. @BellaVida Letty - I love hosting twitter parties! Keep checking here, whenever we host a new twitter party you'll see it listed under the 'Today's Butterfly' section in the upper right hand side of the page!